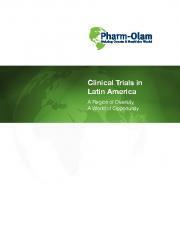 Latin America is hardly the latest new region to be discovered for conducting pharmaceutical clinical trials; global pharmaceutical companies have been running clinical trials in Latin America for over 20 years. Nonetheless, the region is noteworthy because it is still an attractive location for clinical research— and in many ways more conducive to studies than ever before. The more than 20 countries that make up Latin America offer a vast pool of subjects for trials and patients for marketed drugs. Approximately 600 million people live in the region, which stretches from Mexico in the North to Chile and Argentina in the South. Indeed, the combined populations of just three countries, Brazil (192 million), Mexico (103 million), and Argentina (41 million), surpass the U.S. population. Sponsor companies that are sensitive to the differences in demographics and regulations from one country to the next will find that Latin America is ripe with opportunities for clinical research. The benefits—most especially easy access to a diverse patient population—outweigh the challenges of obtaining regulatory approval.